TUCSON, Ariz. — Former Rep. Ann Kirkpatrick served three terms representing Arizona’s largely rural 1st District. She’s seeking a comeback this year from a new seat, the neighboring 2nd, anchored here in the state’s second largest city. But she finds not much has changed. Democrats have long seen the 2nd as a top pickup opportunity in their quest to take back the House next month. Hillary Clinton carried it by 5 points in 2016 and Inside Elections with Nathan L. Gonzales rates Kirkpatrick’s race against Republican Lea Marquez Peterson Leans Democratic. Early voting has already begun in Arizona and runs through Nov. 2. Voters have until Oct. 31 to turn in mail-in ballots. Kirpatrick kept her advice simple Saturday for the dozen or so volunteers — mostly older and mostly female — gathered at the party headquarters here before heading out to knock on doors: focus on how and when voters are going to turn in their ballots. “What day are you off?” “Do you need transportation?” “Do you need child care?” These are questions Kirkpatrick herself asks people when she goes canvassing, she told the volunteers. “What we’ve learned is that most Democratic voters in Arizona are hourly wage workers, and they don’t get time off on Election Day, and they don’t vote. So this is a model that makes it easy for Democrats and independents to vote,” she said. It’s model born from previous tough campaigns — her two most recent races in the 1st District were closely fought. And she credits the strategy for helping her beat back a challenge from former state Rep. Matt Heinz in August’s hard-fought Democratic primary. “We boosted turnout 6 points over the rest of the state in the primary, and we plan on doing that in the general election as well,” she said. Anna Navin, a field organizer with the Arizona Democratic Party, sent the canvassers off on a sunny 80-degree day Saturday with handouts for Kirkpatrick, Senate nominee Kyrsten Sinema (who represents the Phoenix-area 9th District) and gubernatorial candidate David Garcia. “These are all going to be tight races, but we really feel good about the work that we’re doing,” she said. The day started slow for volunteer Connie McDonald, who noted that more people answered their doors the previous week when it rained. But things picked up as the day went on, and the mix of Democrats and independents she encountered seemed energized. She stressed her experience at the local and state levels — she’s the CEO of the Tucson Hispanic Chamber of Commerce. She was also an adviser to Republican Gov. Doug Ducey’s gubernatorial campaign and later co-chaired a business leadership group he launched. Marquez Peterson’s optimism about her campaign is not entirely misplaced. While the 2nd District backed Clinton two years ago, it also narrowly supported Mitt Romney in 2012 and John McCain in 2008. And McSally won her last re-election by 14 points. Marquez Peterson called Kirkpatrick “a career politician who’s moved around the state to run,” something she hammered her for during their only debate earlier this month. But Democrats held the 2nd District as recently as 2014. Former Rep. Gabrielle Giffords represented an earlier version of the seat — the old 8th District — before retiring after she was shot at a constituent event here in 2011. Giffords was an early backer of Kirkpatrick’s campaign, which launched an ad in August highlighting the endorsement. “She was my mentor in the state Legislature and in Congress and really encouraged me to take on this race. 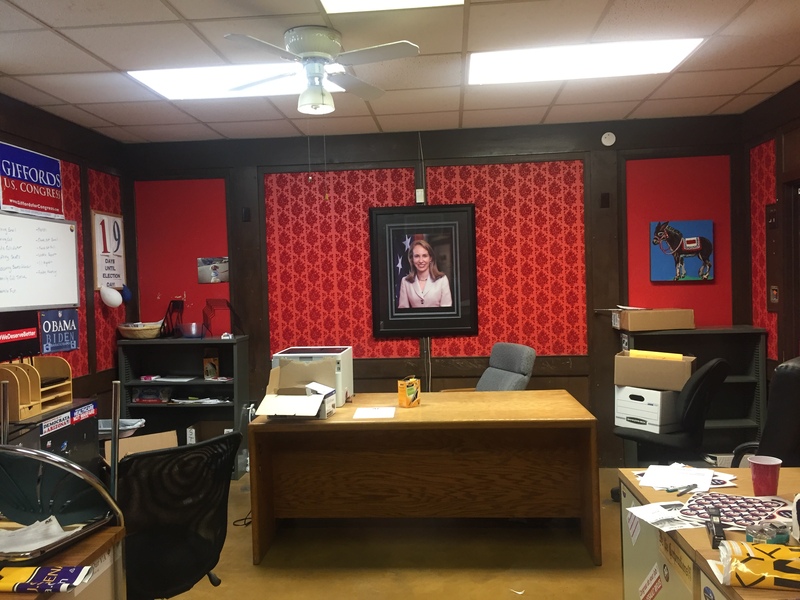 [It] wasn’t something I initially thought I’d ever do again after the Senate race in 2016, but she’s been so supporting and helpful and encouraging, as well as Ron Barber,” Kirkpatrick said. Barber, a former Giffords staffer, won a special election for the seat after the shooting and served one full term before being unseated by McSally in 2014. “They really have been in our corner from Day One,” Kirkpatrick said.